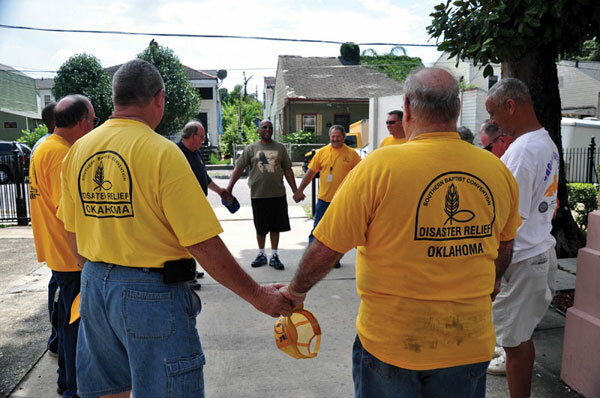 The Oklahoma Disaster Relief Team prays with Cornelius Tilton, pastor of New Orleans’ Irish Channel Church before the block party they helped with. 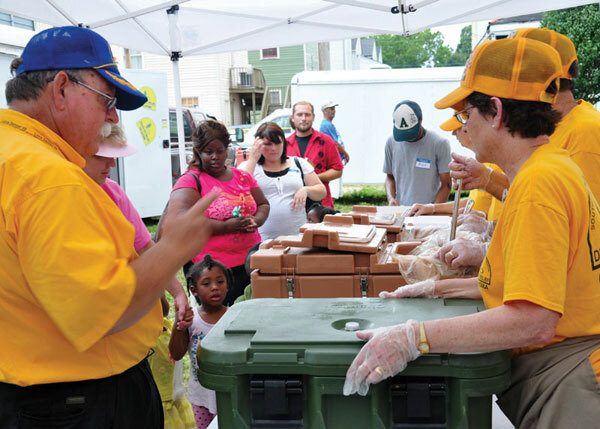 The food preparation team serves red beans and hot dogs to participants. Rice was served with the red beans, but in New Orleans, when you say red beans, it is assumed they come with rice. 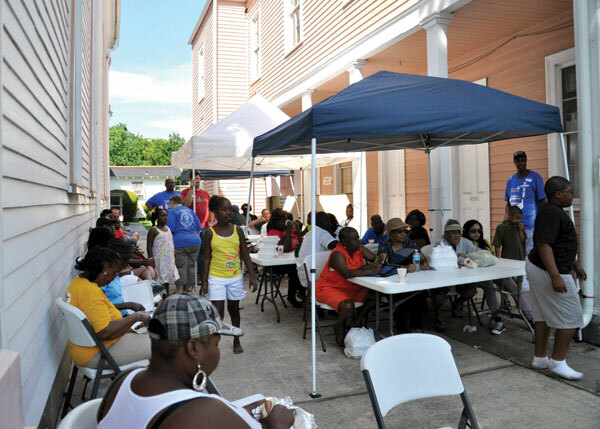 Members of the community particpate in the block party, which was one of 38 block parties in New Orleans, with more than 1,500 volunteers from 59 New Orleans area churches with a number of volunteers from other states. 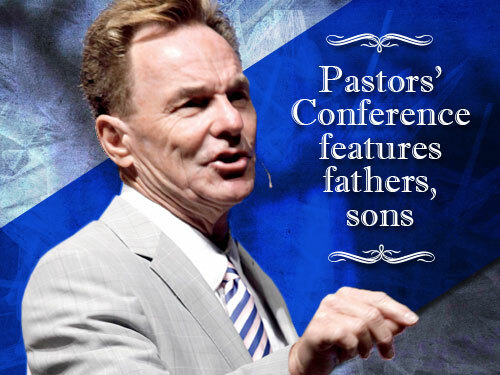 There were more than 1,100 people who made decisions for Christ during Crossover, including 75 from the block party hosted by the Oklahomans. 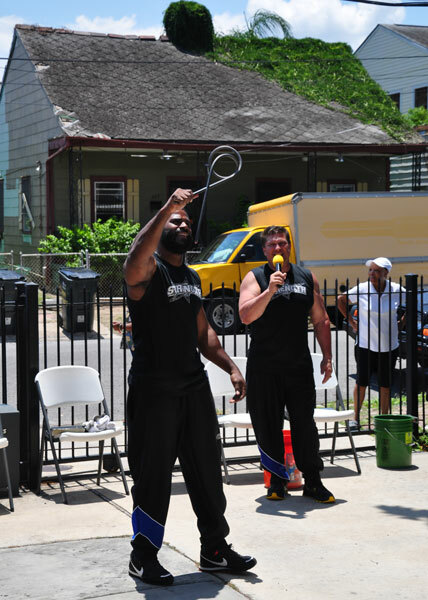 William Green, left, and Mike Hagen, president of the Strength Team, which was brought in by SBC for all block parties to give their testimonies and perform acts of strength to draw the crowds. Traveling 700 miles in three vehicles, members of the Oklahoma Disaster Relief team include, front row from left, Dave Karr, Larry Ferris, Dean Kiser, Robert Wadsworth and David Crowell. On back row are Bill White, Steve Boone, Jim Cook, Paulette Cook, Ann Little, Ron Little and Jim Sheetz. 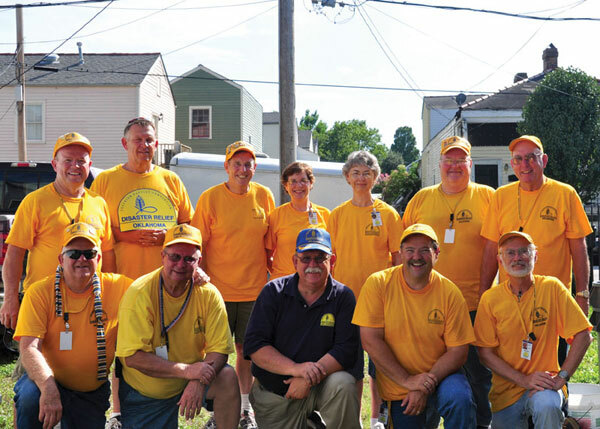 Several members of the team had served in New Orleans following Hurricane Katrina.